Wormhole received a Minister Prize in the software category for the months of January and February at the 2019 K-ICT New Software Awards held on February 18th at the Ministry of Science and ICT in Gwacheon. You can find the full article below. Recently, the Mobile Insight had an article about C2Monster. 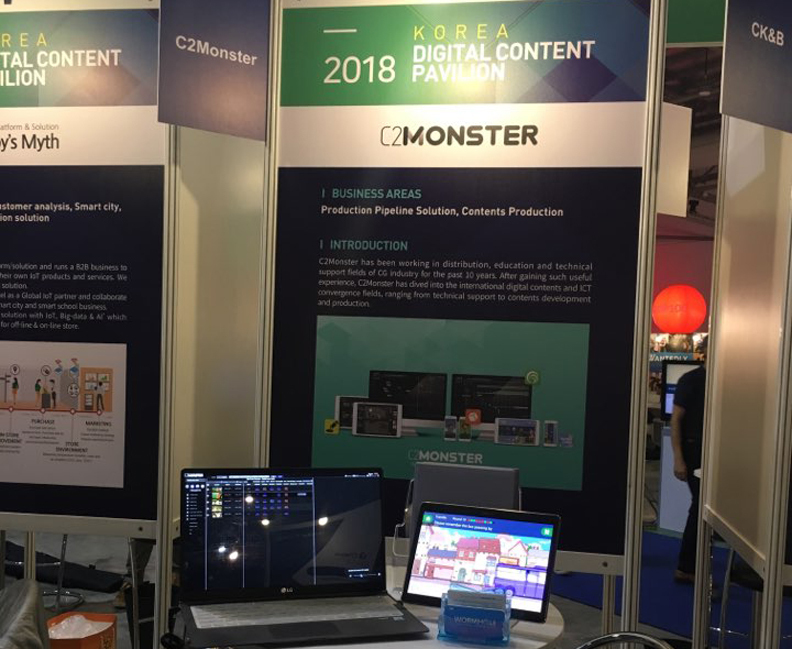 C2Monster participated at the 2018 Korea-India Smart Content Roadshow in Bengaluru from July 9 to 14. 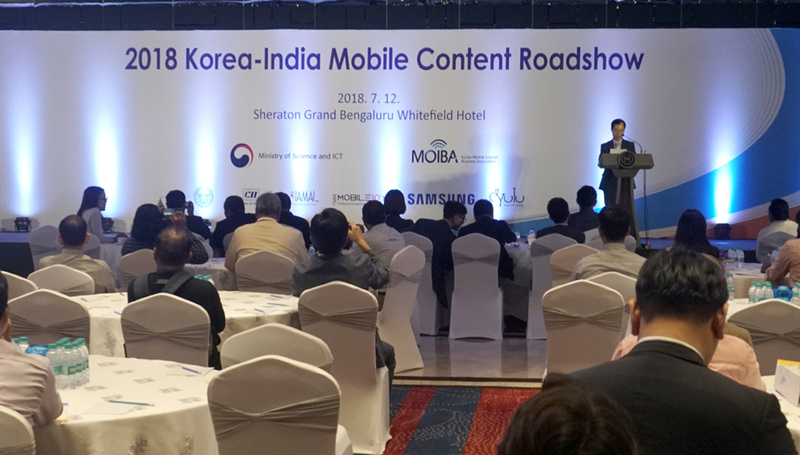 This roadshow was joined by the Korean Ministry of Science and ICT and the Korea Mobile Internet Business Association (MOIBA), together with India’s governments, businesses, and investors. The host city of Bengaluru is known as the Silicon Valley of India, as global leaders such as Microsoft, Google, Samsung, and Adobe have established offices here for the purpose of targeting Indian, Middle Eastern, and Southwest Asian markets. 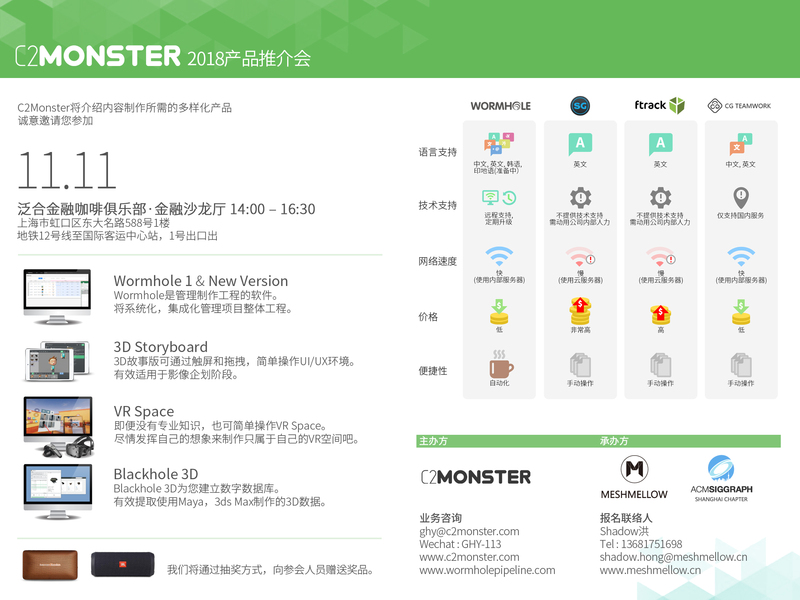 C2Monster took part in the show to promote its content and products to tech and ICT companies, explore demands from local companies through business matching, and develop new partnerships. During the conference and business matching session held in the Sheraton Hotel Bengaluru, C2Monster introduced Wormhole, a content production and pipeline management tool; 3D Storyboard, an iOS-based 3D storyboard production tool; 3D Data Converting Tool, a tool which allows easy management, conversion, and viewing of 3D data on the web through web_gl; and Younger Travel, a game designed to help prevent dementia. At the Korea-India Cooperative Conference, leaders—including MOIBA Vice President, Samsung India’s CTO, and InMobi’s co-founder— provided a forecast and elaborated on global ICT market trends, and offered insight into India’s mobile content market demand and potential opportunities. C2Monster representatives also visited Infosys, the second largest IT company in India, and K-Start, one of the biggest investors in India, to gain new perspectives and information about the Indian market. This event was a great opportunity for C2Monster to gain an understanding of the growth and demand forecast of India, a quickly growing new market, as well as to provide details regarding the company’s own business plans. 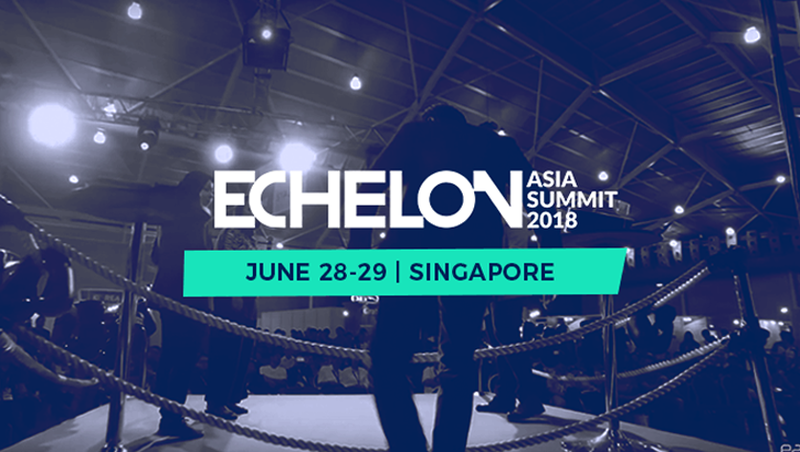 The Singapore Echelon Asia Summit brings together over 5,000 participants, including industry leaders, technology innovators, investors, customers, and experts from start-ups, businesses, and governments. This year’s summit was held from June 28 to 29 in the Singapore EXPO. “3D Storyboard,” an iOS-based 3D storyboard production tool; “3D Data Converting Tool,” a tool which allows users to easily manage, convert, and view 3D data on the web through web_gl; and “Younger Travel,” a game and content platform designed to help prevent dementia and improve the perception of senior citizens. C2Monster attracted many visitors during the summit, and venture capital investors took an especially great interest and discussed the company’s funding scale and progress. 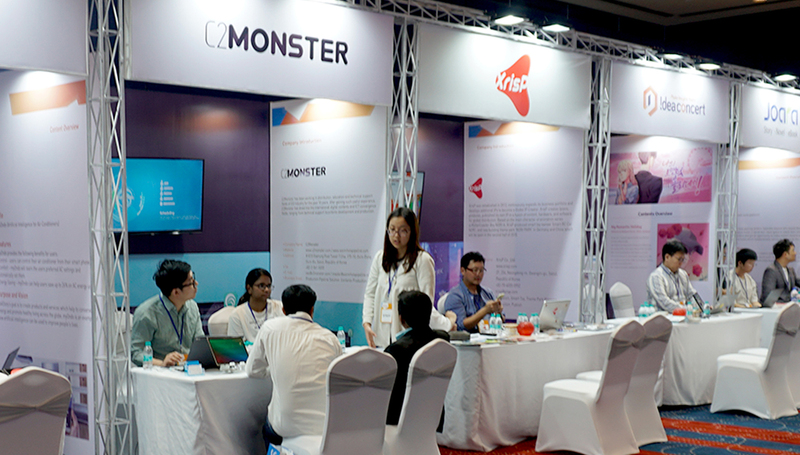 The Government Technology Agency of Singapore visited C2Monster’s booth with an extreme interest in the company’s capability of producing both software and content. 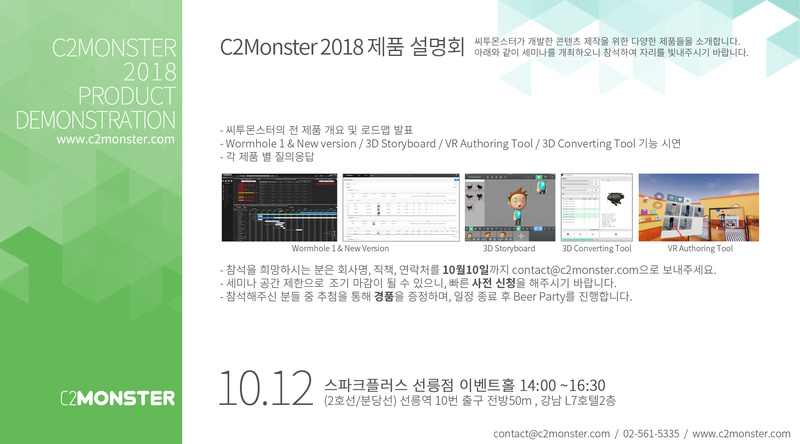 In addition, the Asia Content Network, which manages content production, and DimixLab, creators of an avatar rendering system, discussed business opportunities with C2Monster regarding Wormhole and other products.